Hail the Once and Future King. The Future is finally Here. The Encore -- for the vast majority of its operative band and hence where it matters -- is no conventional cone & dome contraption. If the slower settling times of the usual devices weren't bad enough, their analog crossovers are the most non-linear, handicapped and inaccurate ingredients of the entire audio chain. Just check any frequency response graph in Stereophile prior to averaging. Then check the impulse response charts. Notice how long the drivers continue to ring well beyond the initial burst of the actual signal. Feel your blood pressure rise. 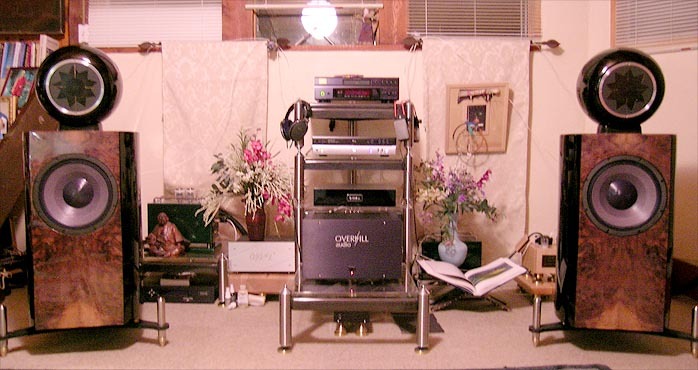 If your amp or CD player behaved even remotely in any such fashion, you'd toss 'em from your upper-story window to silence the neighbor's incessantly barking dog. (That dog probably has good reason for barking. He's a reincarnated audiophile reviewer. He's thus acutely sensitive to how poorly your conventional speakers are really behaving). Billed and priced as a radical assault at the bleeding edge, the Encore categorically eschews non-linear, phase-challenged, passive crossovers. Instead, it relies on phase-correct, active, digital crossovers with ultra-steep 96dB/octave slopes. This attenuation rate insures that what the Manger driver reproduces isn't muddied up by parallel reproduction of the same tones by the massive 12" woofer with its oversized 4" voice coil. The latter's proprietary visco-elastic coating derives from a resonance-attenuating material. That is based on floor damping compounds first used in Orient Express luxo train rides of yore. religiously accounting for its very specific needs. Only extreme chassis measures truly unleash its unique potential. From the outside, the stylish egg-shaped, high-gloss lacquered top enclosure of the Encore thus doesn't begin to transmit the story of what went into creating it. It's built up in hand-applied and slowly cured layers from a fiberglass mold that itself was taken off a wooden master fashioned by a true furniture craftsman. We're now talking wavy 2" - 3" wall thicknesses. They are asymmetrically offset such that no internal surface point faces an opposing one of equal thickness. We're talking 18 different constrained layers. They stack polymer resin/cotton-filler/unobtainium triple sandwiches atop one another in succession. The secret "unobtainium" ingredient differs from tri-layer to tri-layer for a total of 6 undisclosed materials. The name of the game here is extreme self-damping. It effectively absorbs all of the Manger's rear wave to prevent time-delayed out-of-phase reflections through the flat diaphragm with its concentric rings. Driven from 15 powerful neodymium ring magnets and two voice coils, those rings activate outwards with lowered frequencies like ripples in a pond. 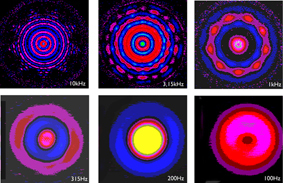 Only a very small central area vibrates to reproduce treble notes [see German diagram above]. Similarly extreme measures are applied to the separate bass enclosure. That's a horizontally stacked affair of 33 laminated Birch Ply layers, each 24 mm thick and routed out to precisely create 3-dimensionally contoured internal spaces and tunnels when stacked and bonded. The insides are lined with a bitumen/foam layer. A first downward angling, then horizontally proceeding line finally vents through a lateral narrow slot at the rear. This line is variably filled with acrylic foam and lamb's wool. Its geometry and lining first increase, then decrease air resistance/pressure behind the woofer to deliberately accelerate its settling times. 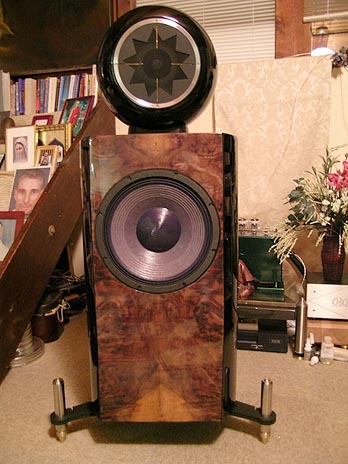 Asked about the bass chassis' substantial heft, Derek volunteered a standard loudspeaker design recipe. To properly absorb a woofer's rear wave, it calls for cabinet mass 1000 times higher than the moving mass of its driver. Overkill Audio outsources construction of the Encore bass cabinet from an English firm that builds 200 lbs precision roulette wheels for the swankiest of Las Vegas casinos. External finishing is handled by another firm which also provides Bowers & Wilkes with their Nautilus-Series Tiger's Eye finish. It's the only UK company authorized to repair the legendary German Steinway piano-black lacquers. When good enough isn't good enough, enter overkill into the equation. While I was still hung up on the monstrous woofer, Derek added that this transducer handles (and has been tested for) 750 watts of sine wave power and 1.2Kw of music power. Disconnecting the Mangers during his setup visit, he demonstrated a Dance Hall track just for its bass sock. Set to ungodly levels that had various objects in my room dancing, the raw driver refused to visibly move. 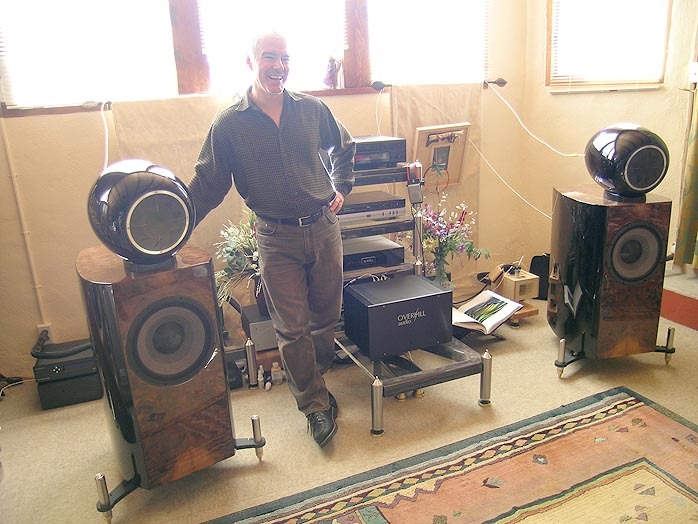 It's fair to say that an outboard subwoofer even for the deafest of headbangers will not be a requirement when you can afford to run Encores in your own castle or Lake Como mansion. On the subject of castles, private butlers and expensive audio hardware, a pair of Encores clocks in at a breathtaking $74,995. Before you reach for your pace maker, this includes the necessary DEQX external digital crossover slash remote-controlled preamp slash EQ slash room-correction engine with Overkill's onboard power supply. It also includes Overkill's own 4-channel, Benchmark Media-based DAC with outboard power supply and A/D board option for users with analogue sources. It also includes Sistrum platforms from StarSound Technologies to serve as resonance-attenuation plinths for the Encores. 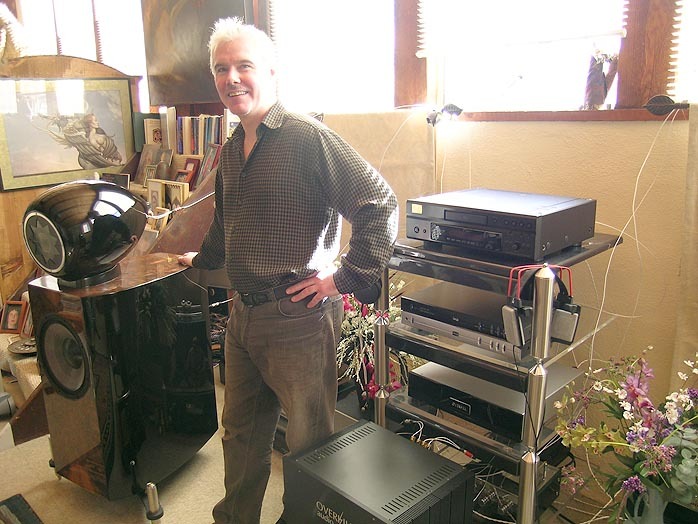 The David Belles-based 4-channel amplifier demo'd at CES and dispatched to Taos for my review is optional. Most customers in these leagues will already own statement-level amplifiers. One word of caution, however: It is mandatory to actively bi-amp the Encores with four identical amplifiers. Tubes most likely shouldn't apply though it's clearly not mondo power that's the prerequisite. The woofer operates with 94dB efficiency and the Manger with 92dB. Outputs are digitally equalized in the network. The Manger runs 1dB more efficient than spec'd by the manufacturer due to its unique cabinet loading. Both the Manger and woofer (decoupled from one another by a massive Sorbothane custom pad that allows adjustments of the egg's horizontal and lateral axes) are so fast that only amplifiers of gargantuan bandwidth/speed will fully support their innate speed and precision. (Tubes will work just fine from an operational standpoint but won't be quite agile enough for the Manger.) Curiously, all this points at amplifiers being ideal which, under standard cone & dome conditions, might not be my ultimate choices. Spectral or Goldmund for example? Think 200kHz+ bandwidth transistors with high current and steep slew rates to not handicap the Encores' response times. From this follows logically that since we're essentially considering a digital system (analog sources must first be converted before reaching the digital crossover), the brunt of the musical responsibility lies with the emotional moxy of the DAC used. Hence Derek Wilson and outside contract engineers have explored the Australian DEQX machine at great lengths to divine its relative strengths and weaknesses. They find its DSP board (embedded with over one million lines of proprietary code) to be heads and shoulders above the next competitor, i.e. of true, uncontested and unequaled reference caliber. ultra chain. The DEQX's brilliant designer -- whom I handed Edgar Kramer's Blue Moon Award at the CES for his stock unit -- concurs without sighs. He's already considering an audiophile "cost-no-object" iteration for extreme applications like Overkill Audio's. That's why Derek Wilson bypasses the DEQX's internal DAC with his own external 4-channel unit with outboard power supply. That's why he left me with two DEQXs, one stock, one Overkill's modified version with massively beefed-up power supply. Depending on whom you ask, the power supply in active audio electronics accounts for 70-85% of the sound. I'd be able to switch between the two digital units to hear power-supply grunt in action. For true transcendental glory, two Zanden DACs following the crossover might be the ultimate weapon. I have two Audio Aero Prima DACs in-house to test just such madness. 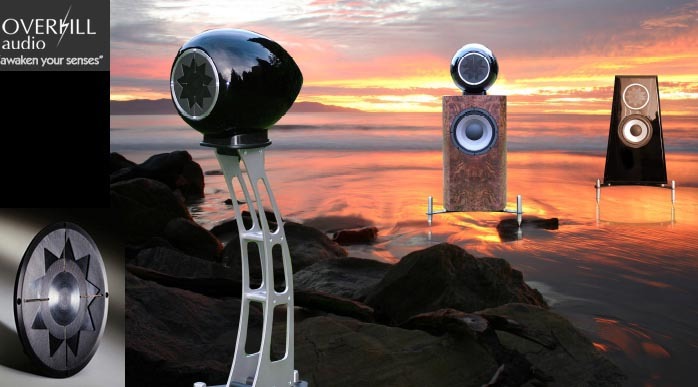 Long live audiophile ambitions for the ultimate! Below Overkill's flagship Encore resides the $44,995/pr Ovation + DEQX with a different woofer and unified cabinet. Below the Ovation, there's the ellipsoid head of the Encore going solo and then dubbed Prey ($27,995 with stand plus DEQX or $23,995/pr as a console-mounted studio monitor). To augment the Prey's single driver bass, there's the $14,995 Predator sub with external 500-watt bridged/balanced stereo amp and upward-firing Encore woofer. This woofer is then loaded into a 360-degree dispersion lens similar to Duevel. Regarding finishes, if they're fabricated anywhere on the globe, they're available to be wrapped around any Overkill speaker, endangered wood species excepted. For security reasons and customer peace-of-mind, each Overkill speaker carries an embedded micro-chip. Its encoded serial number remains permanently hidden from view and is accessible only via the appropriate scanner. The golden appendages of the Overkill Audio team belong to Petra Lewis, Derek's fiancée of the younger (and female!) ears and also mother of 22-month old Emilia. Petra sings with a gospel choir and plays the drums and harmonica. Andy (cello) and Craig (saxophone) are friends "on loan" from the local Cambridge Music Union who routinely provide in-house life performances to serve as the reality standard to which designer Derek Wilson aspires. As will be obvious from the mention of the DEQX, the Encore speaker system provides unprecedented end-user control over frequency response. This accounts for room size and room placement as well as listener preference. From flat-lined to slightly bass-enhanced, midrange-lifted or treble-subdued, you're in complete control. Well, Derek should be - or whoever your domestic installer happens to be. You see, with such broad-scale input over vital parameters comes the (often unwittingly applied) freedom to make musical mistakes. Fortunately, part of the DEQX's remote control functionality is the Profile Bank. This includes Bypass and three presets. After extensive room measurements (via DEQX's supplied microphone, internal signal generator and USB laptop interface), Derek entered three different target curves for my review. They all account equally for <200Hz room-induced nonlinearities but then diverge slightly in midrange and treble band contouring. In the critical vocal range, less than 0.5dB of lift can spell the difference between emotionally compelling and intellectually dry. Instead of the old trial & error of tube rolling or cable swapping to hit upon just the right combination of second-hand factors, this system allows you to attack the essence of emotionally compelling performance like brain surgery right at the crossover - precisely, repeatedly and with full deliberation. And that's the future, here and now. A skilled installer/retail agent incorporates owner feedback to tweak the final sound to 110% satisfaction. He'll commit to software memory three different curves that could be optimized for good and bad recordings. Or, one curve could account for the occasional full-tilt party mood when the windows are opened to your capacious backyard for formal weddings or corporate takeover meets. The options are quite staggering. Most importantly, pesky room issues of asymmetry or limited placement options no longer compromise your audiophile investment. Of course, a high-quality DSP-based room correction device cannot turn turds into gold bullion. 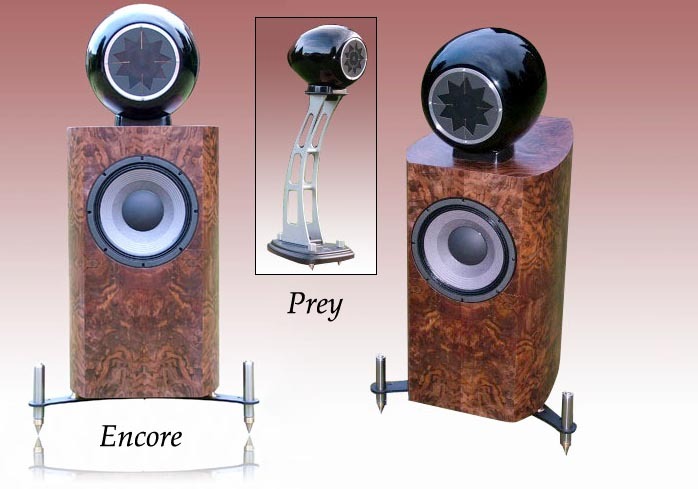 For peak performance, one must start with a superior speaker like the Encore. Don't for a moment consider the DEQX a cheap crutch here. It's a phase/time-correct precision calibration tool that's part of Overkill's comprehensive V.I.P. commitment to any prospective customer.